Info:Pool home located at Westridge. Sleeps 8 people in comfort. 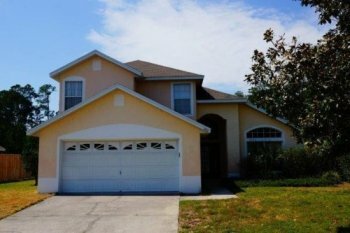 This fabulous 4 bedroom, 2.5 bathroom, two story vacation home at Westridge is available for you to rent on your next Florida vacation. Complete with it`s own private, screened swimming pool over-looking a small lake with pine trees beyond it is perfect for a relaxing holiday. The villa is situated in a quiet location offering easy access to Disney World which will take about 15 minutes by car. This vacation home is also well placed for all the other major attractions in the Disney area. Westridge has tennis courts, volleyball and a childrens play area available. Westridge is located on US27 at the west end of Highway 192 which is home to many shops, supermarkets, petrol stations and a multitude of restaurants catering for a variety of tastes and price brackets. There is a newly built Publix supermarket within 5 minutes drive of your villa. Orlando International airport is about 30 minutes drive away, Sanford airport is about 60 minutes drive and Tampa airport about 75 minutes. The superb Gulf coast beaches can be reached in about 90 minutes while to the east, Kennedy Space Centre and Cocoa beach on the Atlantic coast can be reached in about an hour. Your luxury vacation home has it`s own solar heated, swimming pool which is fully screened and those who fancy an early morning wake up swim will appreciate the convenience of having pool access direct from the master bedroom via patio doors. Pool furniture is provided along with a supply of pool towels for those lazy days spent basking in the Florida sunshine.